The scouts voted last night on who they wanted to be their Senior Patrol Leader. Congratulations to Tristan! A huge thanks for the other scouts that also stood for election. Putting yourself forward can be daunting, but is much appreciated and respected. Aiden will join Tristan as ASPL and by the end of next week’s meeting, all other leadership positions will have been decided. There was big applause for Steven who had been our gallant SPL for the best year, alongside gaining his Eagle rank! The Troop visited a new, reasonably local, canoeing spot last weekend – Lake Sonoma (Hat tip to John L for finding this new spot and booking it). We fielded a modest sized crew of 13 – thankfully Scout Aiden as acting SPL had his navigation skills in play and was able to guide the (often mis-guided) adults and the rest of his scouts to the overnight camp. The paddle was a bit longer than normal – about 7 to 8 miles, but we were helped by a slight wind at our backs. There were a good number of power boats out, but the no-tow zone was quickly reached and the crenelated shoreline made for an interesting paddle. Pros: Relatively easy to get to, relatively easy put in, minimal inspection hassle, lots of boat camping sites, average number of power boats and picnic tables, chemical toilets and fire pits per site. Also… there is a camp on an Island only a couple of miles from the put-in… next time! Notice board history – call to action! The notice board is getting a freshen-up, and as part of that the old pictures have been taken down and archived online. Do you know any of the people in the photos? Can you give them a rough date? PLEASE click through to the gallery below and leave a comment on any photos that you have info on! 10,000 meals in 2 hours! The Troop had a great showing – 10 Scouts and 4 Adults – and we helped from setup at 10:00 all through to the final sweep at 2pm. Our support was welcomed multiple times by the Church and the Rise representative. It was a great chance to log some service hours for the Scouts whilst putting on a strong showing for our Charter org that continues to be very supportive on a number of fronts. I expect everyone is home now and has showered, thrown their clothes in the laundry (or trash) and is looking forward to a big dinner! I really enjoyed the trip and we had a good crew, so thank you to all the hikers. I heard few complaints (most were from me about mixing heavy packs and loose sand), and I am very happy about our choice to go to the Lost Coast. I am missing sitting on the beach during the evening waiting for the sun to set. Strangely, I am also missing going to the local stream or pond to wash my hair. We had some great camp sites- Cooksie Creek and Miller Flat were my favorites. We learned some things about food. Personally, I lost 6.5lbs this week, and that was post Arizona Ice Tea, Taco Bell and McDonald’s french fries today. We brought enough food (we couldn’t have carried more), but we’ll need to ensure our calorie count is higher for future trips. Also, thank you to our logistics crew of Kathy, Phil and Alison Davis. Helping shuttle cars around saved lots of time, extra hiking and headaches. I’m glad we returned with all 13 hikers in much the same physical condition as when they left. However, spend a moment for our “fallen”, including Marion’s Aerobie (which is sailing somewhere in the Pacific), Donald’s glasses (which are now a kit loosely assembled with duct tape), Donald’s Kindle (1/3 of the screen still works), Donald’s disposable razor (in two pieces but evidently functional), Niko’s left boot (still serviceable and fashionable wrapped in bright green duct tape with some excellent cobbling by Allen) and Enzo’s tent pole (not an antenna, Enzo!). I hope everyone had an enjoyable time and feels a sense of accomplishment. Enjoy the extensive photo gallery below! This is overdue, but the summer has been busy. Fabulous support from the parents and families with a changing rota all week, ably led by Donna. Badges, wilderness sleep-over, the Clavey overnighter, Tribe advancement, 3,000 calories per day! I’m going to let the photos speak for themselves – click below! When we think of the fundamental underpinnings of scouting, we think of things like our Scout Law and Oath. But did you ever consider that these may not be quite as set in stone as you imagined? Lets investigate – and take a look at the Scout Law and Oath in a few different countries. You may be surprised by what we find! Let’s take a look and compare this with the current Scout Law and Oath from the United Kingdom – birthplace of Lord Baden Powel and of scouting worldwide. It is pretty similar (they call it a “promise” instead of an “oath”) – but interestingly doesn’t contain the final aspects of the US Oath about physical, mental and moral stance. I would also argue that the choice of words is more gentle; promise vs oath, keep vs obey. For the Law, there are also seven parts. It is close to the BSA Law on some points: trusted, loyal, friendly, considerate (courteous / kind), courage (brave); similar on thrifty (good use of time etc); but diverges notably in explicitly calling out membership of the worldwide family of Scouts and taking about respect. belongs to the worldwide family of Scouts. has courage in all difficulties. makes good use of time and is careful of possessions and property. Scouting UK offers an alternative promise, including sign language / Makaton, and for Hindu, Muslim, Jewish, Christian, humanist / atheist scouts. There is even an approved Arabic version! Time to investigate one of our closest neighbors – Mexico! figures his honor in being trustworthy. is loyal to his homeland, his parents, his bosses and subordinates. is useful and helps others without thinking of reward. is a friend of all and brother of every scout without distinction of creed, race, nationality or social class. is courteous and acts with nobility. sees the work of God in nature, protects animals and plants. obeys responsibly and does things in order and complete. is economical, hardworking and careful of the good of others. Let’s look a little further afield – Khazakstan. Their Oath is very similar to the UK and Mexican Promise, and the Khazak Scout Law has common elements of Mexican, UK and US Scout Laws, with some local variation: I like the elements “a scout is restrainted” and a “friend to nature”! Afghanistan had a strong scouting program up until 1978 when the communist regime banned it. But you can’t keep a good thing down, and in 2003 it began to reform. Scouting in Afghanistan has been co-ed since 1960. I can’t find the detail of the Scout and Law apart from the statement “making a personal commitment“. Use the comments or email the webmaster if you can locate them. (note: Scouting in Afghanistan has not yet passed through international re-accreditation to WOSM, but continues to get advice and guidance from regional bodies). We could go on for ages, after all there are 169 registered national scout organizations! Let’s finish this brief circumnavigation in New Zealand. New Zealand used to maintain an alternative promise, like the UK, but it retired this in 2017 replacing it with a single promise that is suitable for all scouts – setting a lead for inclusivity. What insights can we draw from this short exploration of scout Law and Oaths from around the worldwide scouting community? Maybe that there are some clear common threads: trust, loyalty, doing your best, having courage, being a friend to all. And maybe also that there are some subtle but important differences on the emphasis different countries place on some aspects, eg morality, the environment, and religion. My take away is that we are all a part of the worldwide scouting movement; a movement that shares strong common bonds and also supports local diversity. The scouts had an excellent evening last week practicing some of the basic knots needed for Trail to First Class (and that are generally useful to know). After some patrol time, they finished with a “pet rescue” game, simulating the need to throw a rope and then tie a bowline. Much hilarity – and a little bit or rule stretching – ensued! Re-introducing formal meeting plans is having a really positive impact. This was also the first evening when our new female youth patrol joined. 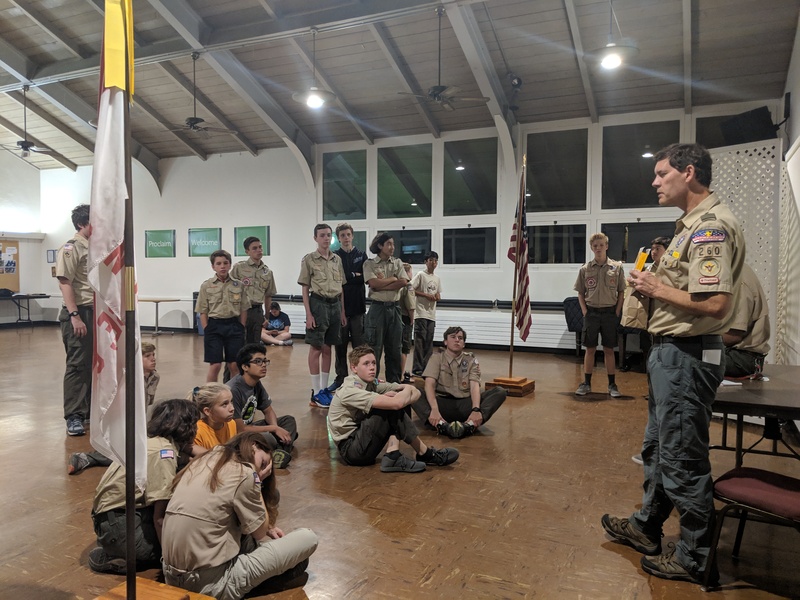 With the formal expansion of the scouting program to all youth from February next year, Troop 260 is making an early start – capturing interest and developing skills. Hi all – the Forms page is now the Library page with a bunch of expanded content. Stuff for scout meetings, like meeting plan templates, games and activity resources. Also admin forms you need for medicals and expenses. This section of the site will grow over time. First Aid is one of the classic scouting core skills. The Troop planned a couple of activities this week: first some skills practice on splints and bandaging, followed by a hand-carry race. Fortunately none of the skills practiced were needed and much fun was had. Doing the race brought home the impact of having to deal with an injured person on an expedition – it’s not easy.